Our History | Perry & Carroll, Inc. The agency was founded by Thomas W. Perry on May 9, 1860. He was a member of one of the first families to settle in Chemung County. Four generations of Perrys have been associated with the business as it underwent changes during the more-than-a-century of its existence. The story of Perry & Carroll started with a boat trip from Wilkes-Barre, PA to Newtown (now Elmira). On board was Thomas Mifflin Perry, father of the founder. Perry stored his trading goods in a log warehouse near the mouth of Newtown Creek and later made sales to the nearby settlers. The year was 1793 and he was 17 years old. He married Elizabeth Konkle in 1798. Her father was John Konkle, one of the area’s first settlers. Seven children were born including Thomas, the founder, in 1818. After holding several clerical jobs he opened the agency. His first insurance carrier, the Phoenix of Hartford, is still represented by the agency. Perry took Winfield Scott as a partner in 1863 and he was replaced by Thomas Gallagher a year later. 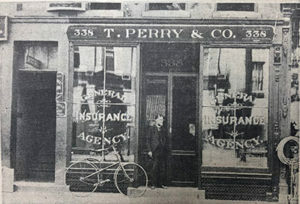 Two years later, the firm was known as T. Perry & Company. Perry’s son, Guy W., entered the business in 1889 and shortly after Fred D. Herrick, a prominent Elmiran, became a member. Thomas Perry died in 1896 and his son and Herrick carried on as Perry & Herrick. They had a disagreement and split the business between them. Guy Perry had several partners after the split, including Belden Sly and Frederick S. Ayers. The agency was known as Perry, Sly and Ayers until it was dissolved in 1910. Guy Perry continued as owner until his death in 1924. Charles W. Perry joined the business in 1922 after college and he assumed ownership when his father died. The agency had been run from a number of locations. At one time it was on Lake St. near the Robinson Building, and for a short time it was at Lake and Water Streets. The location for most of the early years was at 338 E. Water St. Guy Perry later moved the offices to 326 E. Water St.
Charles Perry purchased the building previously occupied by The Sunday Telegram at Baldwin and E. Second St. The offices were moved there in 1926. This was the location of the agency until it moved into its new building in March 1969. 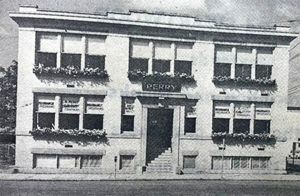 Perry & Thomas J. Maxcy merged their agencies in 1933 and formed Perry & Maxcy. Under their leadership, it expanded into one of the largest insurance agencies in the state. James E. Swartwood, who had been associated with the firm for some time, became a partner in 1948 and in 1952 Perry’s younger brother, James W., became a partner. He died in March 1958 and Mr. Maxcy died in January 1960. On January 1, 1963, Perry & Maxcy changed the name of their firm to Perry & Swartwood, adding George F. Murphy, Harry J. Buehler and William A. Tryon as members of partnership. Associated with the agency is J. Peter Fennell as well as Matthew C. Perry, son of James W. Perry, who represents the fourth generation of Perrys in the business. On November 26, 1969, the firm was incorporated. In June 1969, Perry & Swartwood held its grand opening at its new location “350 Building” 350 W. Church St (corner of Church and Columbia Sts). 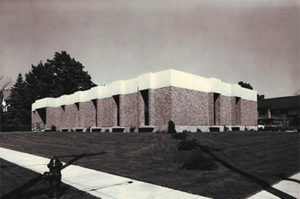 At the time it was Elmira’s newest and most modern office building. In May 1973, The Orrin F. Towner Insurance Agency merged with Perry & Swartwood. The decision to merge was made due to the serious illness of James Towner’s mother, Ida. 1976, Perry & Swartwood and Sindlinger & Burt Inc. merged agencies. The Sindlinger firm was established in 1928 by Lewis E. Sindlinger, and became a partnership in 1965 when Burt joined the firm. Mark J. Hagan joined Perry & Swartwood in May 1979. In 1992, Perry & Swartwood took over Parker Agency accounts when Maxwell Parker retired. In 1993, Perry & Swartwood took over Keeffe & Baker accounts as Herb Epstein retired as owner of Keeffe & Baker. Perry & Swartwood was the largest agency in the Twin Tiers, having doubled in size since 1985! In 1995, Perry & Swartwood acquired the Robert Bowen Agency and Rogers Agency. In 1997 Perry & Swartwood purchased Henbest & Morrisey Insurance Agency from Elmira Savings Bank. This was Perry & Swartwood’s fourth acquisition in five years. The agency is a partnership owned by Bill Tryon, Mark Hagan, Matt Perry, Jim Rogers and Marty Fennell. In 1998, Perry & Swartwood Inc and MacNamara-Carroll Inc. joined forces and on February 24, became Perry & Carroll, Inc. MacNamara-Carroll was established in 1947 by Robert M. Carroll and Joseph F. MacNamara. Tryon became president of the new firm with Carroll stepping in as vice president. Perry & Carroll continued with essentially the same combined staff of the two insurance agencies. The agency now had 33 employees. 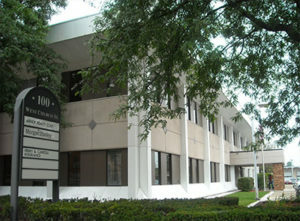 The company temporarily operated from the Perry & Swartwood location at 350 W. Church St. and the MacNamara-Carroll office at 214 College Ave. On May 1, 1998, Perry & Carroll moved all staff to the 350 Building. In June 1998, The Brand Agency Inc. merged with Perry & Carroll, bringing John Brand III on as vice president and a member of the board of directors. In January 1999, Perry & Carroll relocated to our current location at 100 W. Church St.